Interview was first published on: www.wpsprague.com. Milota: How does gender inequality influence public space in Georgia? Why does it matter at all? Etuna: Public spaces are not gender-neutral in Georgia, just like in most places around the world. They are designed for people who are fit, young, healthy and male. But let me give you a few examples of what it means in Georgia specifically. Generally, if you have children, but don't own a car, you are very limited in your movement around the city. And cars! Cars are parked everywhere, absolutely everywhere. If you are not really slim, you cannot pass through the vehicles parked on the pavement - no joke! Public transportation completely excludes parents with infants who need baby strollers just as it excludes disabled people. Luckily, children grow up - but what can disabled or elderly people do? The transportation infrastructure is full of barriers. Subways, underpasses or metal bridges that hover above the streets; all of these structures incorporate stairs. It clearly shows no consideration for people who are slightly different from the accepted norm (fit, young, healthy and male). Minibuses (marshrutkas) are the main means of transportation. They lack the space to prevent the sexual harassment of women and girls that so frequently occurs in such settings. Aside from transportation, there are very few places where you can enter with kids, find child-friendly areas, or even have a room for non-smokers. The list gets longer and longer, but we have to identify some of the challenges. One of them is that women do not only have limited physical access to the public spaces but they are also not represented symbolically. In Tbilisi (as well as in the rest of the country) there are only a few streets, squares, or buildings named after women. Why does this happen? Were there too few women to consider when it came to the naming? Or does it happen because women still have to fight to claim their place in the public space or official histories? I take the latter as a relevant answer and this is what our 50 Women of Georgia project is about. In general, the history of Georgian feminism is complex and full of contradictions. Since the late 19th century, when new social and educational movements gained momentum, advocates for the expansion of the role and function of women in society emerged. However, the political cataclysms of the 20th century halted this natural development: there was no place for feminism in The Land of Victorious Socialism. The totalitarian state that formally granted men and women equal rights was, in fact, deeply patriarchal. In order to change the long-standing invisibility of women in history, the South Caucasus Regional Office of the Heinrich-Böll Stiftung found relevant biographical information and photographs of 50 prominent women in various museums, family and state archives. The information was then published in the form of postcards, featuring the photographs of the women, as well as their brief biographies. Keeping in mind our herstory research and the list of notable women who have just been forgotten (but must be remembered in history and public space), we have decided to negotiate with Tbilisi City Council and suggest our list for future consideration as well as gendering the street naming policy in general. At the moment of signing a Memorandum of Understanding with the Tbilisi City Council, there were around 3,500 streets, among which 1,124 were named after men, 83 after women, while more than 500 streets were unnamed. We believe that this is only a small part of gender-sensitive urban policy that has attempted to reintroduce women to society and thus, reclaim women's names in public memory. Were there any side effects of this project? The initiative also shines a light on the transparency of urban planning. We took responsibility to install information boards in some of the streets that would be renamed after our cooperation. At this moment, 25 streets are being given names from our list. Most of these streets are in the suburbs and did not have a name at all. How did negotiations with the municipality go? Ah, it is a long, rather frustrating, yet empowering story. Empowering in a political sense, as this is a story of women's solidarity and support from within a system that is deeply patriarchal and male-dominated. Officially, the cooperation memorandum with Tbilisi City Council was signed in December 2014. But before the signature, the idea was welcomed and supported by women like Khatuna Samnidze, the current chairwoman of the Republican Party and then-member of the Tbilisi City Council. 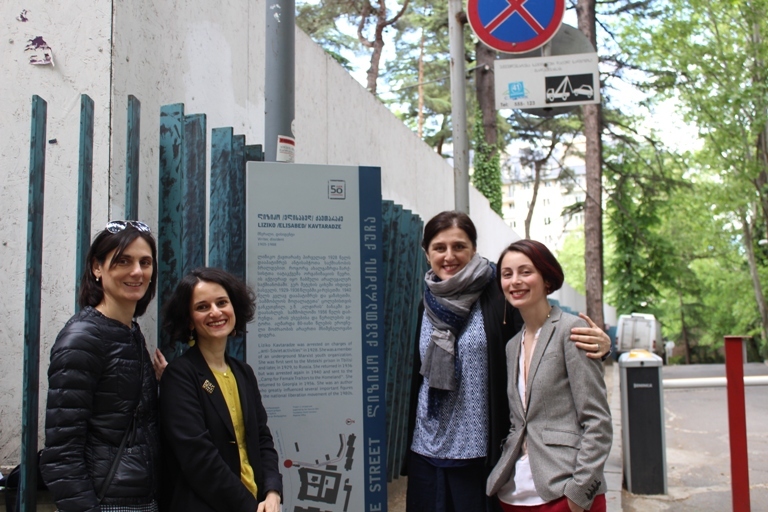 Later, when we cooperated with the Tbilisi City Hall, again, women were the main supporters of the project - for example, Nina Khatiskatsi (Deputy Mayor of Tbilisi) personally advocated for it and also attended the presentation of the first street. According to the initial plan, we wanted to schedule the street presentation on International Women's Day the following year (8th March 2015). Since then, for more than two years, we have struggled with numerous bureaucratic problems and regulations, and, of course, personal attitudes regarding how the street gendering idea should be realised. After the street-naming procedure was finalised, it was clear that we had to be proactive and push the project until the end. We went beyond mere coordination of the process. We had to submit design documentation, get the permits and install the information boards in the streets. Surely, you can imagine the volume of work and patience this process required. And to be clear, this wasn't a typical activity for a political foundation such as Heinrich-Böll. But, bringing this project to the end was a very political act in its truest sense. I have attended several meetings of different committees at the City Hall; I have listened to insulting comments from different members. Some claimed it was a violation of their rights that we obliged them to read biographies of women that they were not interested in. The other comment was that we were supporting further distortion of the city with unnecessary construction. However, along the way, I have also been supported by a number of people; feminists who worked either in the City Council and / or the City Hall, but also ordinary employees and our partners. Moreover, by the female director of the Heinrich-Böll Foundation, Nino Lejava, who was the initiator of the project '50 Women of Georgia', and who supported this extended process for almost three years. It is very unfortunate that the project was made possible only through the efforts of supporters within the system, rather than by means of an opportunity to explore a new path, which could be repeated in future. If we did not have our network, the project would have failed at several stages; it would be rejected by male bureaucrats, who would interpret regulations differently on each occasion, and who have the power to set the rules. Or they would simply reject the design of the boards, as they did during the first hearing. I find this project very inspirational. On the one hand, it raises awareness about female contributions to the history of Georgia, on the other hand, it's aboutgetting active, rewriting the history and bringing it to light – to the street. Was there any reaction to the project or any attempts to repeat in other cities? It was the initial idea that the project would be replicated in different cities. As I know, there have been some initiatives but they have not been coherent. As you see, it took us almost three years to make a presentation of the work done, so for us it was impossible to focus on other cities. You work as a program coordinator for gender topics in Heinrich-Böll Stiftung South Caucasus and you relate a lot to public space. What are your activities within this region? Our activities are mainly focused on education and empowerment. We spread feminist ideas in the region through public lectures, debates, translations and feminist texts. For example, we have recently translated and printed Nancy Fraser's latest publication, Fortunes of Feminism in Georgian. We also try to reach the audience through online publications via the web-resource. The most active recent project on the web is a collection of feminist podcasts on the arts, books, music and movies, called “FeminStream”. You mention the project was a personal mission, so let´s get more personal. How do you see yourself in the future? I am a feminist who tries to make the personal political. What I do at the Böll Foundation as a Gender Program Coordinator or what I do as a feminist activist must be very close to my personal values. This is what I have been doing so far and this is what I plan for the future. I do not want to see myself doing 'gender as usual'. For me, feminist work is deeply personal and what I do is what I am. Is there any message you would like to leave to women (of Georgia)? I wish for more self-reflection among and within feminist groups. Without self-reflection, we are imprisoned in small circles that might become self-destructive for the feminist movement. If we wish for a feminist movement, we must reflect on each other, critically assess the results that we have achieved and develop a vision of gender equality, which will not be void of its initial feminist spirit. As I read in one of the recent studies about Gender Equality within the Georgian political parties: 'Gender Equality is often confused with women's rights'. I wish to reclaim the feminist meaning of gender equality and imagine a radical future for women's rights. Etuna Nogaideli joined the South Caucasus Regional Office of the Heinrich-Böll Stiftung organisation in 2013. She graduated from the Central European University Budapest, Hungary, in 2012 and holds a MA in Gender Studies. During 2012-13 she worked as a research analyst on a variety of projects in the fields of gender, public policy and economic development. Since Autumn 2013, she delivers lectures at the interdisciplinary Gender Studies MA program at Tbilisi State University. Simultaneously, she participates in several volunteer activities organised in support of gender equality and minority group rights.